Congratulations to Year 9 pupil, Roma Boyle, who enjoyed huge success at the Ballymena, Coleraine and Portstewart Festivals in recent months. 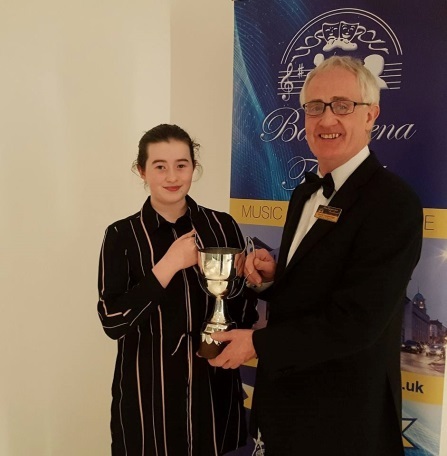 Roma competed in several categories at the Ballymena Festival and was announced as winner of the Ballymena Chamber of Commerce Cup and Bursary and the Newcombe Cup. On the back of her success at the Ballymena Festival, Roma went on to be announced as winner of the Grammar and Secondary Schools’ Own Choice and winner of the Prepared Prose and Ballad Speaking competitions in Coleraine. And it was three times a charm for Roma as she was placed highly in the Open Poem, Bible Reading and Poetry by an Irish Author 17 years and under at the last event in this calendar of Speech and Drama events. Overall, Roma was placed 1st in six competitions, placed 2nd in three competitions and 3rd in one competition. Well done, Roma.